WASHINGTON — A spokeswoman for House Majority Whip Steve Scalise says the Louisiana Republican plans to throw out the first pitch before Friday night’s playoff game between the Washington Nationals and Chicago Cubs. 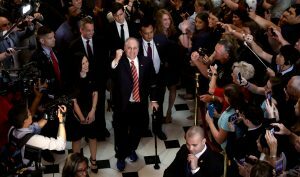 Scalise made a triumphant return to the House last week — more than three months after he was wounded while practicing for an annual charity baseball game featuring members of Congress. Scalise and four others were wounded when a gunman opened fire at the practice.